As many of you will no doubt have heard, a massive earthquake struck Christchurch, New Zealand's second most populated city, in the early hours of Saturday morning. Fortunately, due to the timing of the quake (which I understand was a touch stronger and shallower - ie more dangerous - than the Haiti quake earlier this year that killed 230,000 people), the earthquake strengthening and building standards in force in New Zealand, the speed of response of our emergency services and Civil Defence, and the general actions of many everyday Cantabrians, the (in places severe) damage was largely confined to property and infrastruture, rather than human casualties. We got very, very lucky. Thank you for the messages of concern from overseas. I now live in Auckland, so was well away from the earthquake, but I went to University in Christchurch, so have many friends there. Fortunately all are safe and well, although several have damaged houses. Some of you are also no doubt wondering what this means for The Press Christchurch Writers' Festival, which was scheduled to be held in the Christchurch CBD (one of the worst-affected areas) from Thursday to Sunday this week. As I've said previously, the biennial Festival had a truly terrific programme this year, with more than 80 writers of all types featuring in more than 50 great events over the four days. In terms of crime fiction, there was to be plenty on the plate, including of course the inaugural Ngaio Marsh Award for Best Crime Novel. Right now, I'm not sure of the Festival's status. 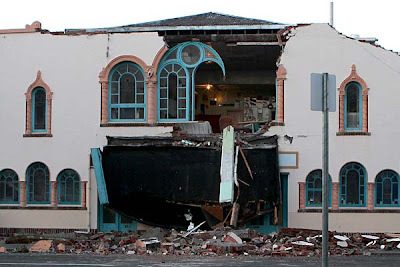 I understand that at least one of the venues (the Repertory Theatre, pictured above - photo by Iain McGregor of The Press) has been badly damaged and will be unusable. I understand the Board of the Festival are meeting soon to determine what decisions should be made with regards to the planned events. I will let you know as soon as I know anything more. You can see more pictures of the effects of the earthquake here, and there are also places to donate online to the Christchurch earthquake recovery - the NZ Herald has listed various ways to donate to legitimate relief organisations here.